The hysteria over the supposed threat posed by the Islamic State (IS) is now undeniable. Every day new stories emerge focusing on the group’s brutality, its resources, its capabilities and its intention to strike out at the West. The US Defense Secretary, Secretary of State, Chairman of the Joint Chiefs of Staff and ranking Senators have all delivered somber assessments of the group’s evil aims in recent weeks, and have they been joined in that effort by a host of counterparts in foreign nations. The mainstream media, for their part, report these pronouncements without question, and with only a bare minimum of context to help their audience understand the group. The Islamic State has gone through numerous name changes since its founding in Iraq in 1999. originally known as Jamāʻat al-Tawḥīd wa-al-Jihād (JTJ), (“The Organization of Monotheism and Jihad”), it changed to Tanẓīm Qāʻidat al-Jihād fī Bilād al-Rāfidayn (“The Organization of Jihad’s Base in the Country of the Two Rivers”) in 2004 after the group swore allegiance to Osama Bin Laden. During this period it was popularly known as Al Qaeda in Iraq (AQI). In 2006 it became the Islamic State of Iraq (ISI), but changed again in 2013 after expanding into Syria. At that point it became Islamic State of Iraq and the Levant (ISIL) or Islamic State of Iraq and al-Sham (ISIS). 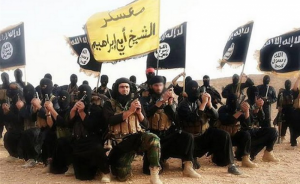 Its latest moniker, the “Islamic State,” came about after the proclamation of a new caliphate on June 29, 2014. What happened in Cyprus was big news all over the world, but within a few news cycles, once European and American officials assured the people it was a limited-scope event, the general population swept potential fears under the rug. No one really reported on the fact that the European Union quickly instituted new regulatory policies that would force bail-ins across the entire continent should such a crisis take hold again. Likewise, Federal Reserve Chairman Ben Bernanke assured Americans that the crisis in Cyprus and Europe posed no risk to the US financial system, citing FDIC insurance for U.S. bank depositors as the safety net that would prevent a similar situation in the United States. The great Cypriot bank heist could soon be coming to the west as Canadian financial institutions along with the Canadian government have outlined their plans for a Cyprus styled bail in regime in the Economic Action Plan of 2013. Your money is officially no longer safe in any of the major Canadian banks. As we’ve witnessed in Cyprus the Canadian government will be looking to loot the accounts of depositors in the event that one or more of the “too big to fail” banks depletes its capital to the point of no return. The failed system of fractional reserve lending has proven disastrous and the time has come to protect your assets from being stolen by the government. Chris Horlacher is a practicing Chartered Accountant providing management and project consulting services to large and mid-sized companies. Chris also sits on the Board of Directors of the Ludwig von Mises Institute of Canada, an international economics and public policy research centre. EU Politicians are calling for bank account raiding to be the new model for bailouts, while the Canadian government submits an ‘Economic Action Plan 2013’ BEFORE Cyprus announced their bailout plans. This can only mean one thing- this ‘new model’ has been in the plans of the globalists all along and Cyprus is only the first to get a taste of it. What can you do to protect your savings? I don’t know- you tell me! Is a “Savings Heist” in the European Union and North America envisaged which could result in the outright confiscation of bank deposits? In Cyprus, the entire payments system has been disrupted leading to the demise of the real economy. Pensions and wages are no longer paid. Purchasing power has collapsed. Small and medium sized enterprises are spearheaded into bankruptcy. Cyprus is a country with a population of one million. What would happen if similar ‘hair cut” procedures were to be applied in the U.S. or the European Union? According to the Washington based Institute of International Finance (IIF) (right) which represents the consensus of the global financial establishment, “the Cyprus approach of hitting depositors and creditors when banks fail, would likely become a model for dealing with collapses elsewhere in Europe.” (Economic Times, March 27, 2013). It should be understood that prior to the Cyprus onslaught, the confiscation of bank deposits had been contemplated in several countries. Moreover, the powerful financial actors who triggered the bank crisis in Cyprus, are also the architects of the socially devastating austerity measures imposed in the European Union and North America. Does Cyprus constitute a “model” or scenario? Are there “lessons to be learned” by these powerful financial actors, to be applied elsewhere, at some later stage, in the Eurozone’s banking landscape? 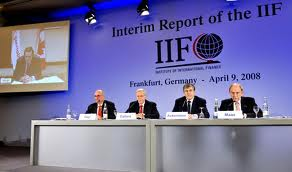 According to the Institute of International Finance (IIF), “hitting depositors” could become the “new normal” of this diabolical project, serving the interests of the global financial conglomerates. What is at stake is a process of “financial cleansing” whereby the “too big to fail banks” in Europe and North America (e.g. Citi, JPMorgan Chase, Goldman Sachs, et al ) displace and destroy lesser financial institutions, with a view to eventually taking over the entire “banking landscape”. The underlying tendency at the national and global levels is towards the centralization and concentration of bank power, while leading to the dramatic slump of the real economy. What this means is that the money confiscated from bank accounts would be used to meet the failed bank’s financial obligations. In return, the holders of the confiscated bank deposits would become stockholders in a failed financial institution on the verge of bankruptcy. Bank savings would be transformed overnight into an illusive concept of capital ownership. The confiscation of savings would be adopted under the disguise of a bogus “compensation” in terms of equity. Because depositors are provided with a bogus compensation, they are not eligible to the FDIC deposit insurance. The most candid statement of confiscation of bank deposits as a means to “saving the banks” is formulated in a recently released document of the Canadian government entitled “Jobs, Growth and Long Term Prosperity: Economic Action Plan 2013″. The latter was submitted to the House of Commons by Canada’s Minister of Finance Jim Flaherty on March 21 as part of a so-called “pre-budget” proposal. A short section of the 400 report entitled “Risk Management Framework for Domestic Systemically Important Banks” identifies bail-in procedure for Canada’s chartered banks. The word confiscation is not mentioned. Financial jargon serves to obfuscate the real intent which essentially consists in stealing people’s savings. The Government proposes to implement a ‘bail-in’ regime for systemically important banks. “This will reduce risks for taxpayers” is a nonsensical statement. What this really means is that the government will not provide funding to compensate depositors who are victims of a failed banking institution, nor will it come to rescue of the failed institution. Instead the depositors will be obliged to give up their savings. The money confiscated will then be used by the bank to meet their liabilities contracted with major financial creditor institutions. In other words, this entire scheme is “a safety net” for too big to fail banks, a mechanism which enables them as creditors to overshadow lesser banking institutions including credit unions, while precipitating either their collapse or their takeover. The Risk Management Bail in initiative is of crucial significance for Canadians across the land: once it is adopted by the House of Commons as part of the budget package, the Bail-in procedures could be applied. The Conservative government has a parliamentary majority. There is a good likelihood that the Economic Action Plan 2013″ which includes the Bail-in procedure will be adopted. While Canada’s Risk Management Framework intimates that Canada’s banks “are at risk”, particularly those which have accumulated large debts (as a result of derivative losses), a generalised across the board application of the “Bail in” is not contemplated. The likely scenario in the foreseeable future is that Canada’s “big five” banks, Royal Bank of Canada, TD Canada Trust, Scotiabank, Bank of Montreal and CIBC (all of which have powerful affiliates operating in the US financial landscape) will consolidate their position at the expense of lesser (provincial level) banks and financial institutions. The Government document intimates that the Bail-in could be used selectively “in the unlikely event that one [bank] becomes non-viable.” What this suggests is that at least one or more of Canada’s “lesser banks” could be the object of a bail-in. Such a procedure would inevitably lead to a greater concentration of bank capital in Canada, to the benefit of the larger financial conglomerates. There is an important network of over 300 provincial level credit unions and cooperative banks including the powerful Desjardins network in Quebec, the Vancouver City Savings Credit Union (Vancity) and the Coastal Capital Savings in British Columbia, Servus in Alberta, Meridian in Ontario, the caisses populaires in Ontario (affiliated to Desjardins), among many others, which could be the target of selective “Bail-in” operations. In this context, what is likely to occur is a significant weakening of provincial level cooperative financial institutions, which have a governance relationship to their members (including representative councils) and which, in the present context, offer an alternative to the Big Five chartered banks. According to recent data, there are more than 300 credit unions and caisses populaires in Canada which are members of the “Credit Union Central of Canada”. Canada’s Economic Action Plan 2013″ acknowledges that the proposed Bail-in framework “will be consistent with reforms in other countries and key international standards”. Namely, the proposed pattern of confiscating bank deposits as described in the Canadian government document is consistent with the model contemplated in the US and the European Union. This model is currently a “talking point” (behind closed doors) at various international venues regrouping central bank governors and finance ministers. 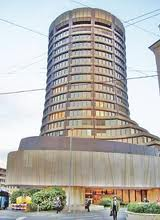 The regulatory agency involved in these multilateral consultations is the Financial Stability Board (FSB) based in Basel, Switzerland and hosted by the Bank for International Settlements (BIS) (image right). 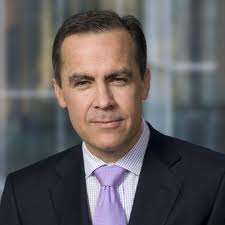 The FSB happens to be chaired by the governor of the Bank of Canada, Mark Carney, who was recently appointed by the British government to head the Bank of England starting in June 2013. Mark Carney, as Governor of the Bank of Canada, was instrumental in shaping the provisions of the Bail-in for Canada’s chartered banks. Before his career in central banking, he was a senior executive at Goldman Sachs, which has played a behind the scenes role in the implementation of the bank bailouts and austerity measures in the EU. The FSB’s mandate would be to coordinate the bail-in procedures, in liaison with the “national financial authorities” and “international standard setting bodies” which include the IMF and the BIS. It should come as no surprise: the deposit confiscation procedures in the UK, the US and Canada examined above are remarkably similar. The bailouts are “rescue packages” whereby the government allocates a significant portion of State revenues in favor of failed financial institutions. The money is channeled from the coffers of the State to the banking conglomerates. In the US in 2008-2009, a total of $1.45 trillion was channeled to Wall Street financial institutions as part of the Bush and Obama rescue packages. These bailouts were considered as a De facto government expenditure category. They required the implementation of austerity measures. Together with massive hikes in military expenditure, the bailouts were financed through drastic cuts in social programs including Medicare, Medicaid and Social Security. In contrast to the Bailout, which is funded from the public purse, the “Bail-in” requires the (in-house) confiscation of bank deposits. The bail-ins are implemented without the use of public funds. The regulatory mechanism is established by the central bank. At the outset of Obama’s first term in January 2009, a bank bailout of the order of $750 billion was announced by Obama, which was added on to the 700 billion dollar bailout money allocated by the outgoing Bush administration under the Troubled Assets Relief Program (TARP). The total of both programs was a staggering 1.45 trillion dollars to be financed by the US Treasury. (It should be understood that the actual amount of cash financial “aid” to the banks was significantly larger than $1.45 trillion. In addition to this amount defence allocations to fund Obama’s war economy (FY 2010) was a staggering $739 billion. Namely the bank bailouts plus defence combined ($2189 billion) eat up almost the totality of the federal revenues which in FY 2010 amounted to $2381 billion. What is occurring is that the bank bailouts are no longer functional. At the outset of Obama’s Second term, the coffers of the state are empty. The austerity measures have reached a deadlock. The purpose of the global financial actors is to wipe out competitors, consolidate and centralize bank power and exert an overriding control over the real economy, the institutions of government and the military. Even if the bail-ins were to be regulated and applied selectively to a limited number of failing financial institutions, credit unions, etc, the announcement of a program of confiscation of deposits could potentially lead to a generalized “run on the banks”. In this context, no banking institution would be regarded as safe. The application of Bail-in procedures involving deposit confiscation (even when applied locally or selectively) would create financial havoc. It would interrupt the payments process. Wages would no longer be paid. Purchasing power would collapse. Money for investment in plant and equipment would no longer be forthcoming. Small and medium sized businesses would be precipitated into bankruptcy. The application of a Bail-In in the EU or North America would initiate a new phase of the global financial crisis, a deepening of the economic depression, a greater centralization of banking and finance, increased concentration of corporate power in the real economy to the detriment of regional and local level enterprises. In turn, an entire global banking network characterized by electronic transactions (which govern deposits, withdrawals, etc), –not to mention money transactions on the stock and commodity markets– could potentially be the object of significant disruptions of a systemic nature. The social consequences would be devastating. The real economy would plummet as a result of the collapse in the payments system. The potential disruptions in the functioning of an integrated global monetary system could result in a a renewed global economic meltdown as well as a drop off in international commodity trade. It is important that people across the land, in the European Union and North America, nationally and internationally, forcefully act against the diabolical ploys of their governments –acting on behalf of dominant financial interests– to implement a selective process of bank deposit confiscation. 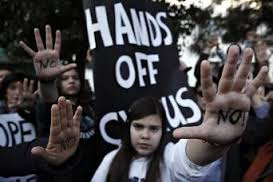 As the Cyprus fiasco focuses attention once again on the faltering Euro, the public is finally questioning the value of the money in their wallets and bank accounts. But as the issue of monetary reform gains currency amongst the public, a vast array of complimentary currencies are already helping people facilitate transactions without the central bank administered fiat money. Find out more in this week’s GRTV Backgrounder on Global Research TV. Rest easy, Canadians, for your bank accounts are going to be made as safe as those bank accounts in Cyprus. Just take a look at the Canadian government’s budget plan for 2013, particularly pages 144 and 145 of Economic Action Plan 2013. There the Canadian government promises to use Canadian deposits to save “systematically important” banks (emphasis ours). The Government proposes to implement a “bail-in” regime for systemically important banks.This regime will be designed to ensure that, in the unlikely event that a systemically important bank depletes its capital, the bank can be recapitalized and returned to viability through the very rapid conversion of certain bank liabilities into regulatory capital. This will reduce risks for taxpayers. The Government will consult stakeholders on how best to implement a bail-in regime in Canada. Implementation timelines will allow for a smooth transition for affected institutions, investors and other market participants. Those bank liabilities that will be allowed to be converted into regulatory capital? Those include customer accounts. Apparently bailing “out” banks with tax money is too 2012. Now bail “ins” with customer money are all the rage. When a bank deemed “systematically important” finds itself in trouble, taxpayers won’t be on the hook to provide the funds to rescue the bank from its bad decisions. Instead the bank will get to look inward, toward its own customers and the funds in their accounts. The Cypriot model is catching on. The report says “in the unlikely event” that one of the banks becomes “non-viable.” How do you think not having to worry about losses will affect the bankers’ attitude toward risk, however? We’d say that this government-guaranteed ability to raid deposits will make the banks act more recklessly and also guarantee that the deposits will raided. The big banks in Canada will get to take on enormous risks in pursuit of greater profits for themselves without having to worry about their losses. After all, any losses will now be covered by the bank customers money that they put in their with the crazy notion that it would be safe from theft. Before you chuckle at the silly Canucks who thought they’d be safe, ask yourself if your bank account is really safe too. Because this legal right for the banks to steal deposits is becoming the new normal all across the Western World. It’s well on its way to becoming the law in Europe as early as 2015. The European Commission has already written a draft of the law which will protect deposits under 100,000 euros, but which will treat deposits over that amount as capital that can be “bailed in”, i.e. stolen to make up losses. Personally, I cannot understand how anyone in Canada, the US or anywhere in the Western World could think even for a second that their money is safe in a bank, especially these days as The End Of The Monetary System As We Know It (TEOTMSAWKI) is forcing the governments and banks to show their true colors and just outright take people’s money. They aren’t even bothering to hide their larceny with inflation or borrowing anymore. The banks are the first line in the government-corporate offensive against individuals. Keeping your money in the bank at this point is like giving the keys to your house to a family of kleptomaniacs with pyromaniac tendencies. Don’t be surprised if all your stuff ends up getting swiped and your house is burned to ground. Also, due to recent legislative reform, Canadian securities held by those with domicile in Canada can no longer be traded in accounts held in other parts of the world. Non-Canadian banks have been sending letters to their Canadian customers to inform them that they must sell or transfer any Canadian securities held in their accounts by an April 5 deadline. Canadians can’t even transact with an offshore broker who isn’t registered in their specific PROVINCE. Even US slaves are a bit freer in this regard as they only have to file with the SEC. Of course, the best of all worlds is to unslave yourself entirely by getting a passport in a freer country so you can let go of your US or Canadian slave card. The barriers for doing business outside their nation-state’s borders will only increase for Americans and Canadians. We believe that there will be a lot more slaves from the Western World fleeing out of their currencies into Bitcoin. Europeans, particularly the Spanish, are leading the way, but Americans and Canadians will be forced to start running too. You can also be part of the vanguard who is using technology to avoid the government-banking-fiat currency system altogether by switching from fiat currency accounts to the decentralized digital currency realm with Bitcoin. If you must have a bank account, don’t keep it in one of the kleptomaniac banks of the Western World. Instead get the account in a safer, less indebted country. See how TDV can help you with offshore banking options here. NICOSIA – In approximately three weeks time, the island of Cyprus will begin receiving its annual cash injection – from holiday tourism. That’s what’s known as a ‘good injection’. After only a day here, it’s become very clear that the people of Cyprus are concerned, some even scared – about a financial contagion and shock treatment which threatens their future prosperity. Soon, they will get another ‘bad’ injection, which we are told will be deadly. So we are treating this like a crime scene. The next injection will be administered by ‘Dr Troika’. Just utter his name in public here and you will see wrinkles in people’s faces. Dr Troika’s injection is the equivalent, in economic terms, to an experimental vaccine – designed to treat a financial contagion which originated in Greece, and Wall Street before that. It is certain to provoke an auto-immune reaction. The people of Cyprus did not ask for this, yet, they are being forced to take it by the mad economic doctors in Brussels, Berlin and the IMF. It’s the sort of bad medicine that the banking syndicates and corrupt officials have been administering for a while now, in order to take down governments and economies all over the globe with devastating effect. I arrived in Cyprus on Wed night, and was joined by UK-based writer and talk show host Jason Liosatos from Global Peace Radio at 5am Thursday morning, as we headed in to the capital city of Nicosia to document what many were expecting to be a run on the island’s banks at 12pm after 15 days of closed doors to hundreds of thousands of residents whose savings has been locked inside the banks during the extended “bank holiday”. This particular ‘holiday’ will go down in history as one of the worse on record. The lines began forming around 11am, but to everyone’s surprise – except the Cypriots’ of course, the lines were not as long as many expected, and not as long as the corporate mainstream media expected either, most of whom were hoping for a fight in front of both the old town’s Bank of Cyprus (good bank) and Laiki Banks (bad bank) branches. 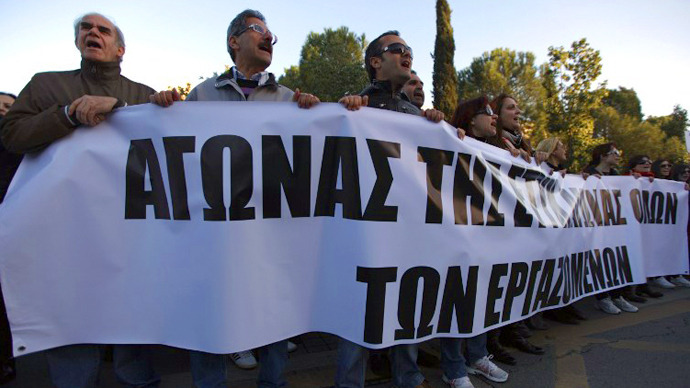 The majority of those queuing were older people, but these included many of the top depositors whose life saving have been clipped by the Troika. 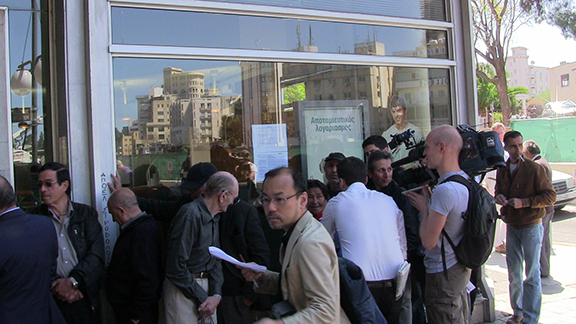 We asked around and quickly learned why the Cypriots did not all rush the bank on Thurs at high noon. Many residents told us that there was a community feeling that islanders did not want to stress the Bank of Cyprus by storming its branches. Strict capital controls have been put into place to slow the cash hemorrhaging this week, with most residents restricted to 300 euros per day, for four days, followed by an official assessment of the situation. There’s a lot of talk of Cyprus’s potential riches from untapped gas and oil, and many residents believe the bankers have taken down the economy here in order to exchange the island’s future riches for a series of expensive (if not utterly debilitating) ECB and IMF loans. But that’s still a ways off, and more pressing matters are salary cuts, pension cuts, a flight of wealth off of the island, and of course – that fact that people’s money is being literally stolen from their accounts. When elites go to war, and fight their financial battles, it seems that the only victims are the average mom and pop. After meeting 5 or six local residents and business owners, it came abundantly clear that even the street sweepers knew that a criminal banking syndicate had held a gun to their heads and then stolen their money in broad daylight. PHOTO: We sit down with the neighborhood guys who really know what’s going on with Cyprus bank collapse, and do foreign exchange over coffee. Not surprisingly, there were no Russian Oligarchs waiting to get inside any of the island’s branches on Thursday, many of them apparently withdrew their money from still open Russian branches of Laiki and Cyprus banks – at the same time that the banks in Cyprus were shut. Watch the UK Column Live TV program on Tues at 1pm GMT, and visit the UK Column website for more reports from Cyprus. 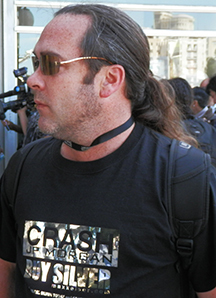 Also, you can listen to daily reports this week from Cyprus at The Pete Santilli Show, M-F 12pm PST/7pm GMT. Cyprus and the Troika have agreed to a 20 per cent tax on deposits over 100,000 euros at the Bank of Cyprus and 4 per cent on deposits held at other banks. A senior Cypriot official told Reuters that a plan to tap nationalized pension funds would not be a part of a plan to raise billions of euros in return for a bailout from the European Union. Cyprus said earlier on Saturday that it was looking at seizing a quarter of the value of big deposits at its largest bank in order to raise such funds. “Unfortunately, the events of recent days have led to a situation where there are no longer any optimal solutions available. Today, there are only hard choices left,” European Union Economic and Monetary Affairs Commissioner Olli Rehn said in a statement. Cyprus is scrambling to come up with €5.8 billion by Monday, or face being kicked out of the Eurozone. The cash is a prerequisite for a further €10 billion in bailout funds. Lawmakers’ rejection of a previous proposal to tax all bank deposits prompted the European Central Bank to threaten to cut off emergency funding to Cypriot banks unless a deal was reached by March 25. Banks have been shut all week, and are due to reopen on March 26. 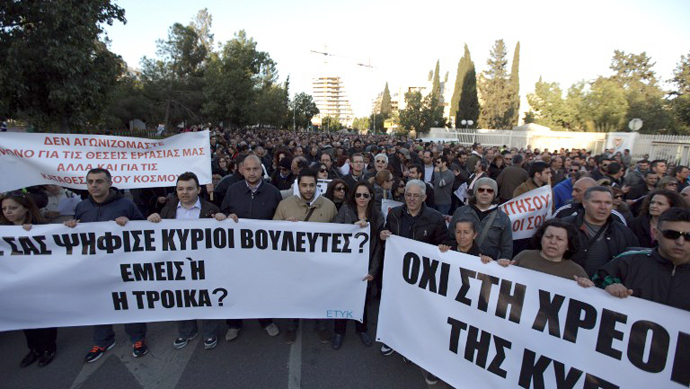 Earlier on Saturday, at least 1,000 bank workers in Cyprus hit the streets of the country’s capital of Nicosia. 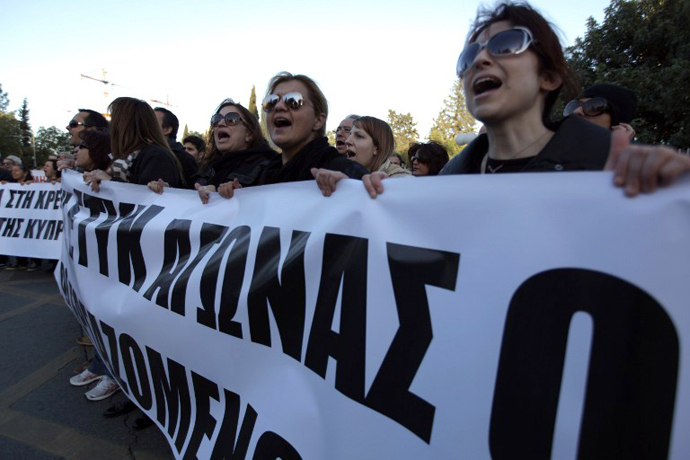 The demonstrators marched against the latest bailout measures taken by the country’s central bank. All ages were present at the demonstration, with many parents pushing their children down the street in strollers. “I’ve been working for 20 years and I’ve paid all the taxes of all my pension contributions and every Euro. Now I run the risk of losing my job and my pension, and I will have no money to support my children,” Cyprus Popular Bank employee Angela Panayotou said, as quoted by Ria Novosti. Panayotou, who brought her five children along to the rally, says she believes plans to split the Cyprus Popular Bank in two to be a political move. “We are convinced that the bank is viable, and it there’s no need to close it,” she said. The Cypriot parliament has adopted a new bailout plan which is comprised of nine laws about the recovery of the country’s financial system. One of the laws gives the Cypriot Central Bank special authorities due to concerns the financial system may collapse. Chancellor Angela Merkel is now warning Cyprus, quote ‘not to test the boundaries of the Troika’s patience’. That is after one avenue of rescue, a deal with Russia, all but evaporates. Nicosia and Moscow failed to agree on a rescue plan, after intense negotiations in the Russian capital. 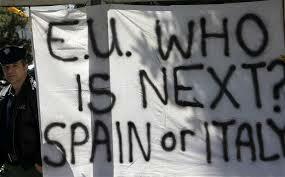 The Cypriot government is due to present the EU and IMF with a new plan, dubbed Plan B, to secure a bailout. Andreas Tiedtke, a Free Voters Nuremberg candidate for the Bavarian Parliament, gives a German perspective on the crisis.